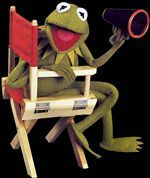 The U.S. Mint today announced a three-year agreement with The Jim Henson Company in which Kermit the Frog, the legendary television and film celebrity, will serve as the official ``spokesfrog'' for America's 50 State Quarters Program. Kermit the Frog will soon be starring in broadcast and print commercials for the 50 State Quarters Program. The announcement was made by Philip N. Diehl, Director of the U.S. Mint, and Kermit the Frog himself, at New York's Muppet Townhouse, the east coast headquarters of The Jim Henson Company. The Henson organization, an established leader in family entertainment, has achieved international acclaim with its beloved Muppet characters over the last four decades. Kermit the Frog was selected as ``spokesfrog'' to raise public awareness of the 50 State Quarters Program, a 10-year initiative (1999-2008) commemorating each of the 50 United States with a unique quarter design. In his new role, Kermit will appear in an extensive print and broadcast campaign designed to educate Americans -- of all ages -- on America's newest change. This unprecedented program introduces new designs for the quarter's reverse side every 10 weeks over the next 10 years. The quarters are introduced in the order the states entered the Union. The idea for this program came from American coin collectors and was strongly endorsed by the American public through extensive market research conducted by the Department of Treasury. Presenting a different quarter design for each state, the program honors each state's unique history. The U.S. Mint has already issued quarters for three states: Delaware, Pennsylvania and New Jersey, with Georgia and Connecticut quarters to follow later this year. The Jim Henson Company, an established leader in family entertainment for more than 40 years, is an independent multimedia production company; one of the top licensors in the industry; a leading publisher of children's books; and home to Jim Henson Television, Jim Henson Interactive and Jim Henson's Creature Shop(TM). The company is headquartered in Los Angeles with offices and production facilities in New York and London. The Jim Henson Company's website is located at http://www.henson.com. The 50 State Quarters are manufactured at both the Philadelphia and Denver Mints, which produce all legal tender U.S. circulating coins. The quarters are then shipped to the Federal Reserve for distribution through the private banking system. The Federal Reserve orders new quarters to ensure an adequate supply to meet the needs of commerce as commercial banks demand. The Mint projects production of 500 to 800 million quarters of each state design. Each quarter is produced for only 10 weeks, so consumers are encouraged to keep checking their pocket change regularly to collect each of the state quarters. For more information on the 50 State Quarters and how to collect them, visit the Mint's web site at http://www.USMINT.gov.